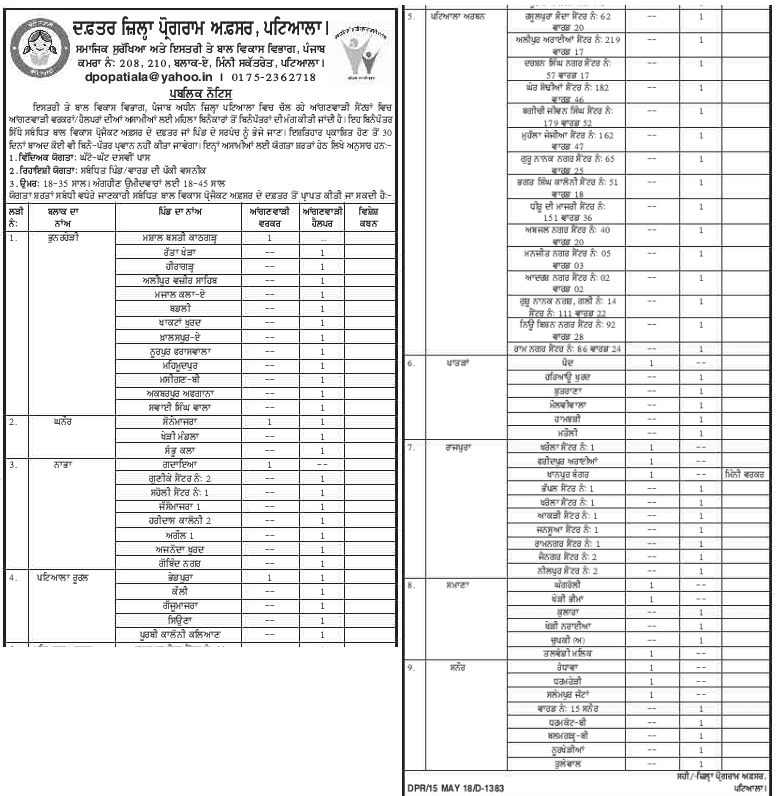 Office of the District Programme Officer, Hoshiarpur Punjab has given a notification of 50+ Helpers and Workers Vacancies in the Hoshiarpur District. The interested candidates can apply for Hoshiarpur Anganwadi Recruitment 2018 on or before 29 June 2018. 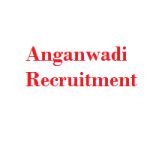 Anganwadi Hoshiarpur Recruitment 2018-19 notification is out. As per the Notification, there are 50+ Helpers and Workers Vacancies. The educational qualification is matriculation. The age limit is 18 to 35 years. If you are looking for Matriculation Pass Jobs in Hoshiarpur Anganwadi then this article is going to be very helpful for you. The candidates applying for helpers and workers vacancies should have passed the matriculation. You can send your application to the related Child Development Project Officer (CDPO) through registered post or personally on or before 29.06.2018 till 05.00 PM. The candidate must be the permanent resident of that area. Last Date: 29 June 2018. Office of the District Programme Officer (DPO), Patiala has given a notification of 100+ Anganwadi Workers and Helper Vacancies from the female candidates. The interested candidates can apply for Patiala Anganwadi Recruitment 2018 within 30 days from the date of notification. Punjab Anganwadi Recruitment 2018-19 notification is out. As per the Notification, there are 100+ Anganwadi Workers and Helper Vacancies. The educational qualification is matriculation for the helper and worker posts. The age limit is 18 to 35 years. If you are looking for 10th Pass Jobs in Patiala then this article is going to be very helpful for you. The educational qualification is matriculation pass. The candidate should be a permanent resident of that village and area. 18 to 45 years for Handicapped (PWD) candidates and 18 to 35 years for all others. You can send your application within 30 days of this notification/advertisement in the newspaper to the related Child Development Project Officer (Bal Vikas Project Officer) or the Sarpanch of the village. Last Date: Within 30 days from 15.06.2018. Office of the District Programme Officer, Patiala, Social Security and Women & Child Development Department, Punjab Room No. 208, 210, Block-A, Mini Secretariat, Patiala. Bathinda Anganwadi has given a notification of 40 Workers and Helpers Vacancies. The interested candidates can apply for Bathinda Anganwadi Recruitment 2018 within 30 days from the date of notification. Punjab Anganwadi Recruitment 2018-19 notification is out. As per the Notification, there are 40 workers and helpers vacancies. The educational qualification is matriculation pass. The age limit for Anganwadi Bathinda Bharti is 18 to 35 years. If you are looking for Jobs in Bathinda Anganwadi then this article is going to be very helpful for you. The candidates applying for Bathinda Jobs should have passed the matriculation examination. The candidate (Female) should be the permanent resident of that place. The age limit is 18 to 35 years. Last Date: Within 30 days from the date of notification. Office District Programme Officer, Ferozepur has given a notification of various Anganwadi Workers, Mini Anganwadi Workers, and Anganwadi Helpers Vacancies for the Anganwadi Centres and Mini Anganwadi Centres of District Ferozepur. The interested candidates can apply for Punjab Anganwadi Recruitment 2018 within one month from the date of this notification. Ferozepur Anganwadi Recruitment 2018-19 notification is out. As per the Notification, there are various Anganwadi Workers, Mini Anganwadi Workers, and Anganwadi Helpers Vacancies. The educational qualification is 10th pass. The age limit is 18 to 35 years. If you are looking for Anganwadi Jobs in Ferozepur then this article is very helpful for you. The candidate must be a permanent resident of that village/city and must be matriculation pass. As per Punjab Govt. rules. You can send your applications (attested by the Gram Panchayat/Nagar Council/Corporation of that village) to the related office of Bal Vikas Project Officer (Child Development Project Officer) within one month from the date of advertisement of this notification in the newspaper. Note: The application format can be obtained from the office of Child Development Project Officer (C.D.P.O). Kindly attach your attested copies of qualification with the application form. Last Date: Within 01-Month from the date of advertisement. Anganwadi Vacancy 2018: Department of Women and Child Development, Punjab (Chandigarh), Office of District Programme Officer (DPO), Patiala has given a notification for the recruitment of 22 Anganwadi Worker, Mini Worker, and Helper Vacancies. The interested can apply for Punjab Anganwadi Recruitment 2018 on or before 11 February 2018. Anganwadi Punjab Latest Jobs News 2018 – 19 notification is out. 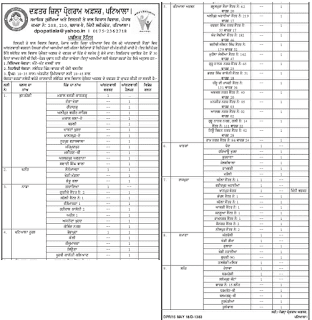 As per the Notification, there are 22 Anganwadi Worker, Mini Worker, and Helper Vacancies. The educational qualification is 10th Pass. The age limit is 18 to 35 years. If you are looking for Anganwadi Jobs in Punjab then this article is only for you. For Handicapped Candidates: 18 to 45 years. For Others: 18 to 35 years. You can send your applications for Punjab Anganwadi Jobs 2018 Development Project Officer or to the Sarpanch of the village within 30 days from this publication.